A splendid setting for a dreamy celebration. 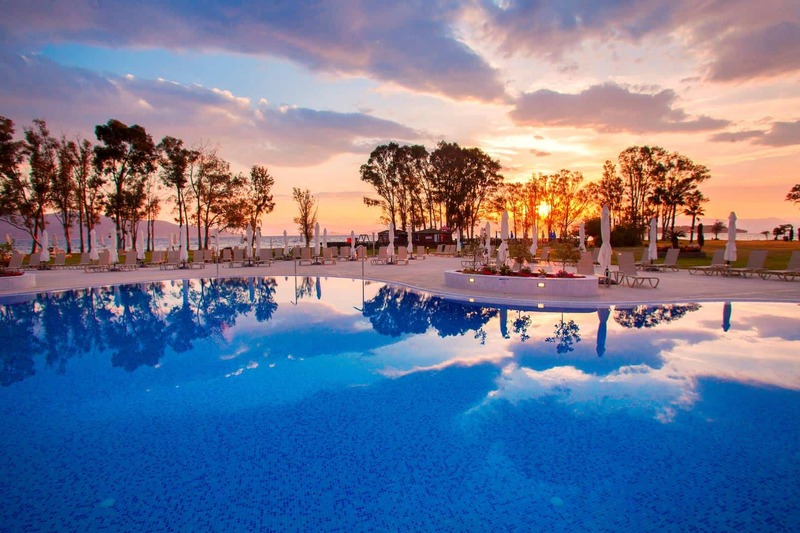 The Family Life Kerkyra Golf is designed to welcome and comfortably accommodate families as well as couples. Vast gardens, a variety of pools and spa facilities, and exceptional all-inclusive dining options make this an all-round favourite only minutes away from Corfu town and its airport. 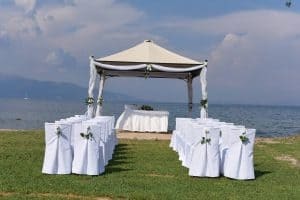 Set up includes: Ceremony table with white skirting, one fresh flower arrangement on ceremony table and up to 30-35 chairs with white cover. All of the above mentioned venues are available in the Thomson/First Choice wedding package, and include basic décor of white covered ceremony table, up to 20-30 white-covered chairs and a fresh flower table arrangement for ceremony table. The hotel offers 3 distinctive Signature themes which can be booked direct with the hotel. 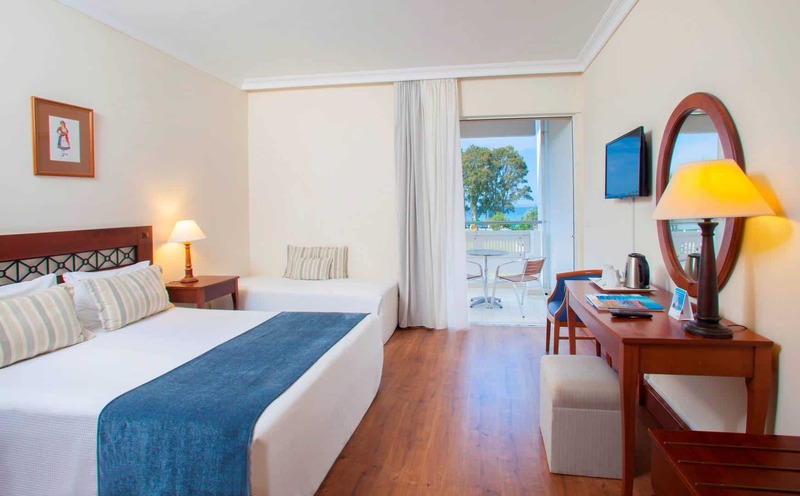 We have just booked for our 4th year in a row for our 4th wedding anniversary. Yes, we offer a stand for the wedding dress. Placed in rooms upon request only. Yes, we provide a room for the groom in order to get dressed. (free of charge). 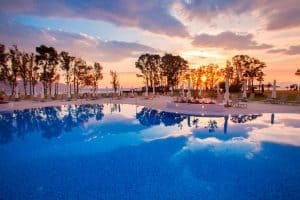 In Corfu there is no possibility to hold an official wedding ceremony at the hotel, as the couple can get married only in the town hall. 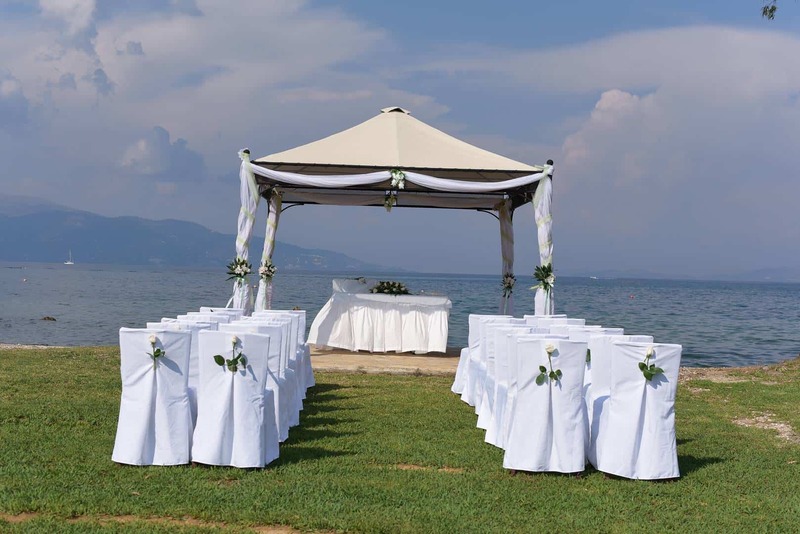 For an unofficial ceremony we can provide up to 30-35 chairs with white covers. For unofficial ceremony, upon request, with no extra charge. 11. Do you provide any other decoration at the ceremony venue? Prices vary depending on chosen brand of sparkling wine/champagne. Current price of lowest sparkling wine is € 30 per bottle. €80 for 2nd tier and €50 for any additional tier. It takes place at the ‘Gardens Gazebo’ in which case the cake cutting is organized at any other available venue. 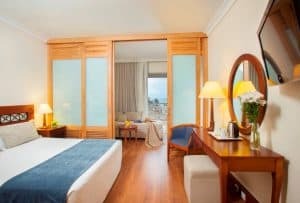 Hotel can put the tables together for the wedding group but it will not be private as other hotel guests will be in the same dining area. The set up would be indoors or outdoors, at one of the restaurant’s sides/corners. 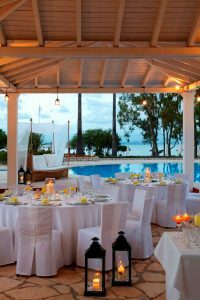 With a fee of €450.00, the table can be decorated with Louis Hotels signature themes including balloons, flower arrangements, candles, theme coloured linen and other table decorations. If you have a special theme colour in mind, we can arrange it accordingly. Current charge €55 per adult & €27.50 per child under 12yrs old (prices subject to small increase for 2015/2016). ‘Day Pass’ charges must be pre-paid before wedding ceremony. Note: ‘Day Pass’ includes only what is part of hotel’s AI package. If wedding couple chooses a private wedding menu, this is charged extra and discount is given on the above mentioned ‘Day Pass’ charges. Can be provided in our veranda of Mura by Akakiko restaurant with a rent of 150,00 euro (set up with tables and chairs dressed with white covers included). If non-resident guests wish to attend the ceremony and reception? 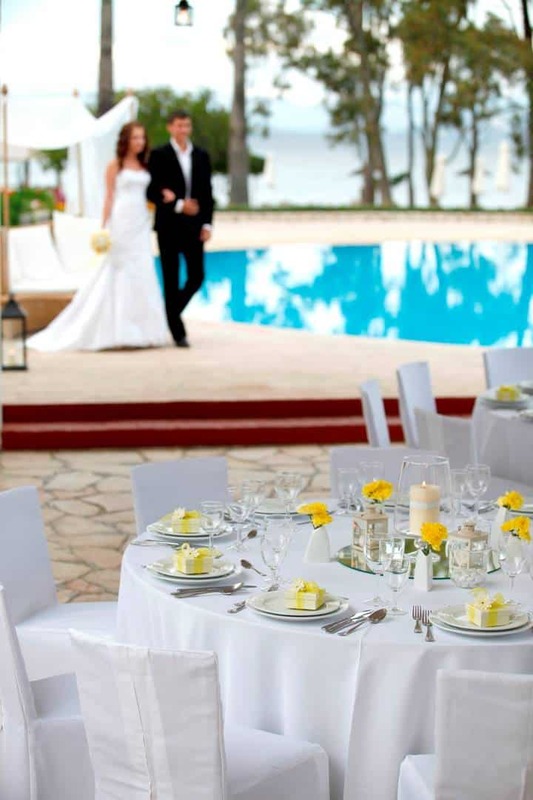 NOTE: A discount on the ‘Full Day Pass’ is given to non-residents attending a ‘private wedding reception’, for which the wedding couple has already paid for their private meal. Discounted Charges: €35 per adult & €17.50 per child under 12yrs old. b. ‘Drinks Pass only’: €30 per adult & €15 per child under 12yrs old. Drinks only from the ‘all inclusive drinks package’ from 10:00 to 12:00 midnight. NOTE: ‘DRINKS PASS CHARGES’ MUST BE PRE-PAID BEFORE WEDDING CEREMONY. 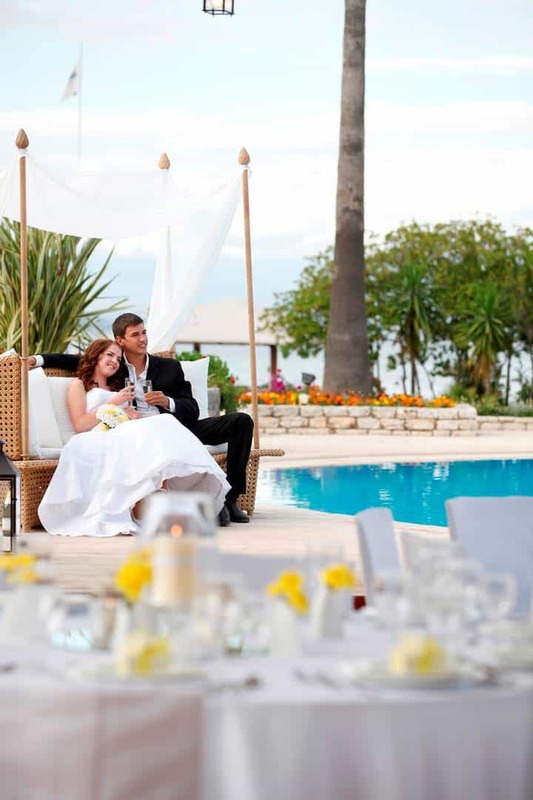 c.	There is no charge for non-residents attending only the wedding ceremony and when no food or drinks are consumed. 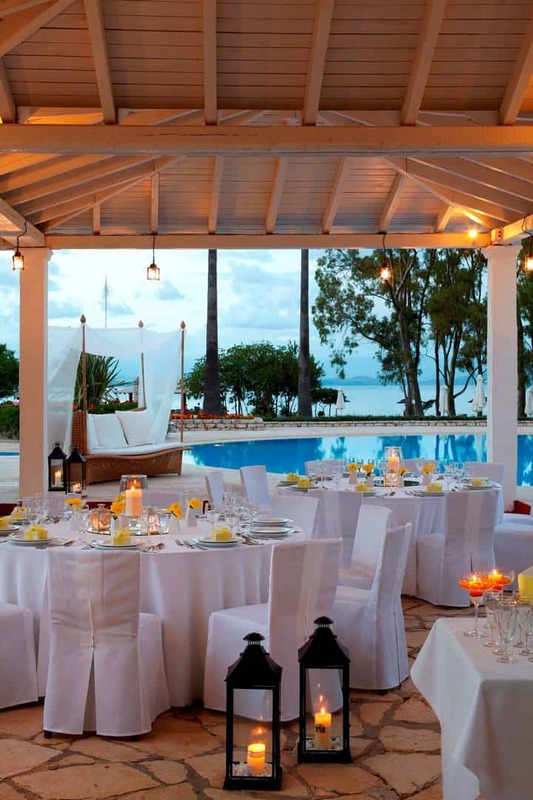 Guests choosing to have their wedding reception dinner at the ‘Aspelia’ private venue, would need to select one of the hotel’s Private Wedding Reception Menus at an additional charge.